You could call the worm pink or the kettle black, but either way, Hammer No More The Fingers colored this EP stunningly. The same way Pablo Picasso created magnificent abstract paintings, Hammer created a magnificent EP, which is becoming an expectation for the trio from Durham North Carolina. 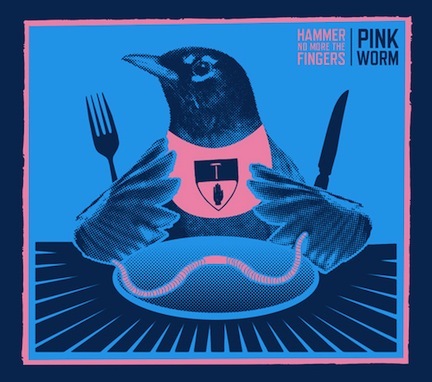 Pink Worm is the essential addition to Hammer’s discography, and a must own for Indie Rock fans all over the world. Intricately pieced together, the tracks never fail to play volleyball with emotions. Ranging from happy-go-lucky to soul-searching, sometimes within the same song, Hammer has painted a Picasso. Weaving listeners in and out of an emotional roller coaster that we all call life, Pink Worm is sitting in the controller’s seat. Drawing influence from a wide array of music, it is next to impossible to classify Hammer No More The Fingers’ as anything other than indie rock. Showing respect to the music world, each member instrumentally is excellent. At any given moment it sounds as if all of them are leading, creating an atmosphere of a power struggle that can only exist between friends. Focusing on one instrument can be tough because of the excellent filler instrumentals, where the songs as a whole feel simplistic and soothing. Listening to Pink Worm is the musical version of walking into The Louvre with the soul purpose of jumbling everything together and only taking the best part of each piece to create a masterpiece of epic proportions.